We are very excited to be a part of the Reproducible Document Stack (RDS) project led by eLife Innovation. 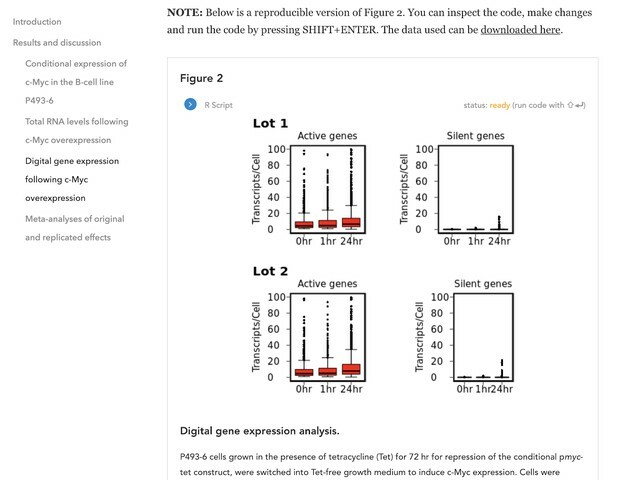 eLife just published an article on one of the main outputs, computationally reproducible manuscripts. In September 2017 eLife announced the start of the Reproducible Document Stack (RDS) project, a collaboration between Substance, Stencila and eLife to support the development of an open-source technology stack aimed at enabling researchers to publish reproducible manuscripts through online journals. Reproducible manuscripts enrich the traditional narrative of a research article with code, data and interactive figures that can be executed in the browser, downloaded and explored, giving readers a direct insight into the methods, algorithms and key data behind the published research. Read the full article on the eLife website. You can launch the reproducible article example here.